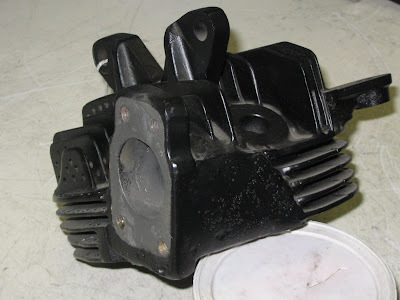 "God Prefers King James Era English"
In part 1 and part 2 of 68 Inch Racer, I outlined the physical dimensions and bottom end parts for this "dream" motor. In this installment I would like to wrap it up with the top end and valve train. 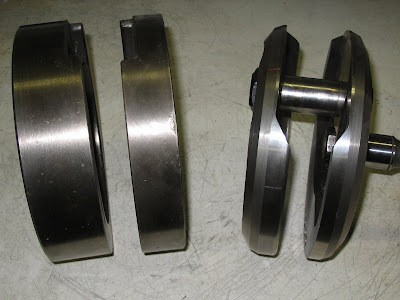 As to the heads, if I had a set of dual carb Knuck heads laying around (which I do) I would probably use them. After all, if I am going to label this a "racer" then why would I be worried about the leg clearance issue raised by two carbs sticking out the left side of the bike. Intake valves; 2.060". I had a set custom made by Ferrea Racing for a motor I did last winter. Beautiful valves, and no need for a lash cap, but I was disappointed with their limited selection of tulip choices for a 3/8" stem diameter. The only one they offer had more tulip than I wanted, which necessitated shorting the bottom of the guides slightly. It was also quite a bit heavier than I would have liked. Perhaps a 5/16" stem next time with a custom made valve guide. It goes without saying that the piston domes, exhaust ports and combustion chambers would get the ceramic treatment like this. Working off a couple of Knuck heads that I have oiled out in the past, it looks as though a head volume of 128 cc is a realistic starting point. Now, if we bore the Knuck heads out for the Pan cylinder's fire ring, we actually increase the head volume by about 5.71 cc's. But of course the fire ring itself will take up most of that increase. The total head volume when bored for the fire ring, but taking into account the amount displaced by the fire ring, calculates to 128.38 cc. But here is where it gets interesting. The 74" Pan cylinder is shorter than the 74" Knuck by .200" when measured gasket surface to gasket surface (5.530" vs. 5.330). But if you add the height of the Pan fire ring they are the same length. That means that the piston will come to the same point in relation to the gasket surface on the Knuck cylinder as it does to the top of the fire ring on the Pan. But in effect you are lowering the head .200" down by using the Pan cylinder (think of it like shaving the head .200") Now we are talking some compression! When I plug all this into my Engine Analyzer program with a .020 thick copper head gasket, it comes out to 12.26:1 compression ratio. And after double checking all my figures a couple times, it still comes out to that! Cool. Now we are into race gas territory (68 inch Racer - remember). That kind of compression will allow us to run a fairly radical cam as well. Any time you talk about high performance on a Knuckle engine, in my book there is really only one brand of cam to consider, and that is Leineweber. I am thinking his #3 Knuckle cam. It has .420 lift and 312 degrees of duration, but keep in mind this duration is measured at .020" rather than the customary (for Harleys) .053". That is still probably near 275 degrees duration if converted to .053". Keeping with the "racer" theme, everything seems to point toward an engine that will not be easy to start. So we might as well add a magneto. I'm envisioning a bike that does not even have a kick starter. 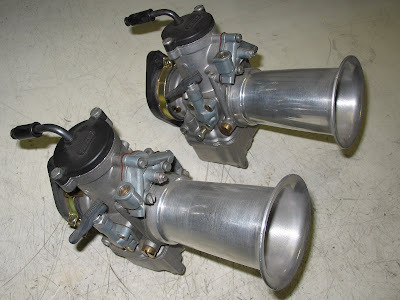 Since this "paper engine" is getting a set of real life vintage dual carb Knuck heads, I would also use a set of real life 40mm Dell 'Orto pumper carbs that I have left over from my first drag bike. They were a little small for the 114" Knuckle, but I suspect they would work well in this application. Since the heads have a 4 bolt Linkert pattern, I would weld flanges onto the Dell 'Ortos to match. Jetting them to run on E85 (85% ethanol) would be really tempting. It has enough octane for this kind of compression ratio, plus the government helps pay for it (with my money). Good luck on getting them to kick in for your $15 a gallon racing gas. One last thing. If the motor was to be used on the drag strip, then I would leave the valve train open, with no oil going to the top end. This is not a huge advantage, it just simplifies the oiling system and eliminates any clearance issues between spring and cover. But that's the way we used to do it, and it looks pretty cool. For any other application I'd enclose the valve train. Either way I'd use a pre '40 oil pump for the thinner gears and less oil volume in the motor. That pretty well wraps it up. Did I miss anything? And.... an even better question: will it ever get built? Here is another selection from my great grandfather, L.J. Schlattman's book of poems "Gleanings from Life". And lead you safely to the goal. Eternal truth, and will prevail. And must admit, "We do not know;"
Illumes the way for us to go. Dig deep enough and you'll find GOD. 'Twill still shine on when all is done. "Your faith in God is but a tale;"
HE reigns supreme and will prevail. And human theories shall break. And faith in Him will scale the sky. If you read my post entitled Paper Engines, you will recall that I solved the problem (at least on paper) of building a high compression 61" Knuckle lower end with a 74" top end. There still are a few things to be considered in the bottom end. For one thing, there is the subject of flywheel weight. That will be partly determined by the end use of this motor. Whether it is for drag racing, "street" racing, Bonneville, flat track, or some sort of road racing. For most of these scenarios, I would lighten the flywheels (the one exception being drag racing with a slick). How much to lighten them is the question. The minimum would be to cut down the heavy left side flywheel to the thickness of the right side wheel. Bike weight is also a factor here. Flywheels "store" energy, so the heavier the bike, the harder it will be to get under way from a dead stop with extremely light wheels. Still, the gain in the rate of acceleration is too good to pass up in most applications. Since the UL rods are an aftermarket imported item of somewhat unknown quality, I would at the very least have them shot peened. Possibly polished and shot peened. The purpose of polishing is to remove any possible surface imperfections that could lead to a crack. However, polishing also removes the surface left from the forging process which increases the strength of the rod. Shot peening puts that harder surface back on (so to speak). So, just shot peen, or polish and shot peen, but do not polish only! Of coarse the rod change alone would dictate that the flywheels be balanced, but it becomes even more critical when lightened. Since the point of this engine is to turn some RPMs, the crankpin and mainshafts are probably not a place to skimp. S&S makes all of the early shafts, including the stepped crankpin, and are probably the highest quality available. Yes the rod set will come with a new crankpin of unknown origin, but that would be better set aside to go in a restoration that will not see such severe service. This is to be a "Racer" and not a restoration, so why not take advantage of the built in extra strength of Panhead cylinders. Even bored to +.060 (which makes it a true square engine 3.5" bore x 3.5" stroke) the Pan cylinders are undoubtedly stronger than a Knuck cylinder. Sure, there are reproduction Knuck cylinders that are stronger than stock, but they aren't cheap. I would spend the money elsewhere. Besides, there are plenty of Knuck heads out there that have been converted to the Pan headbolt pattern already, so why not use them. For pistons, I would start with a cheap Pan/Shovel cast piston which is called a 10:1. The dome volume on them is about 52cc which will get some compression ratio (I'll discuss that more when I get to the heads). Once the domes are ceramic coated and the skirts Teflon coated they should work very well. Last Friday evening, my wife and I took our '46 Studebaker downtown for a local car show. As we were relaxing on a bench, enjoying the evening, two well dressed young men wearing name tags approached us. As you have probably guessed, they were LDS, better known as Mormons. Since we had left the house on short notice, I found myself unarmed. (That being a lame allusion to Ephesians 6:17 "And take the helmet of salvation, and the sword of the Spirit, which is the word of God:") That, however was not a good enough reason for me to avoid talking to them, but that along with the setting did lead to an abbreviated conversation. After establishing that I was a veteran of conversations with LDS representatives on several previous occasions, and that they had all ended in a "standoff", the inevitable question came up. Did I have any questions. Well, actually I did. Some time ago I started to read the Book of Mormon so that I would be at least somewhat familiar with it for just such occasions. The first thing that struck me was that the language was so strikingly similar to that used in the King James translation of the Bible. That was my question. Why was the Book of Mormon, "translated" in the 1800's, translated into the language of 1600's England? This is where the "Elder" of the pair jumped in to take over the conversation. I think that is usually a good sign that you have them off their talking points. His answer was that it was the language God chose to supernaturally guide the translation into. I pointed out that the translation of the KJV bible was not supernaturally guided by God, but he disagreed, saying that both the KJV and the Book of Mormon were supernaturally translated. I suppose that would have been a good time to ask why they do not speak in that vernacular in their everyday language, but instead I moved on to a much more important point. I brought up the law and how it was there to show us how sinful we are. I pointed out that Paul said ".....that sin by the commandment might become exceeding sinful." (Romans 7:13) Without a proper appreciation of how desperately sinful we are, we can never understand how hopeless our case is without Jesus sacrifice. That pretty much capped off our conversation. Of course they both agreed with my statements about the law and Jesus sacrifice for sin. But it was the agreement of one speaking a slightly different language than I, and not that of one feeling the conviction of their sins. In retrospect I feel that I should have gone to specific commandments rather than a broad appeal to the law. Given the age of the young men, Jesus statements about adultery may have been just the thing. Oh well, I will likely get another shot at it yet this summer when they appear on our doorstep! It is probably more common in the automotive field to dream up engine combinations on paper that will likely never be built. Sometimes though, something triggers that urge in my tiny little brain too. Of course, working in the Harley industry, that is usually the type of engine that figures into my daydreaming. With the recent advent of relatively reasonably priced reproduction UL connecting rods becoming available, those tiny little gears in my head started turning. For me, it is not the designing of a motor with numerous custom (read: expensive) built components that gives me satisfaction. The combination also has to make some sense from a monetary standpoint to make it "cool" in my mind. That obviously stems from some long lost and unrecorded Scotch ancestry. In other words, yes, I am cheap! In the past I have touched on the dilemma of 61" Knuckles or Panheads running cylinders that have been bored to the 74" bore size. Sure you can use 74" pistons with no clearance problems, but with the stroke of the 61" flywheels, the piston will not come to the top of the cylinder, dramatically lowering the compression ratio. This is not really a problem for your typical restoration or Sunday afternoon cruise bike, but to the true gear head, it is an unwelcome compromise. Besides, what about the legendary "square" motor? (a "square" motor is one with the same bore as stroke) While there may be more hype to it than substance, there still is a certain mystique involved. And with the 3 1/2" stroke of the 61 and 3 7/16" bore of the 74 you are almost there! As I mentioned above, the availability of UL rods brought this into my mind. The easy way to get that piston to come to the top of the cylinder when using a 74" piston on a 61" flywheel is either a custom made piston with the wrist pin location moved, or a custom made longer rod. Either of those can easily be accomplished if you are willing to spend a lot of money. But like I said, that kind of spoils it for me. But the UL rods are longer than OHV rods. Hmmm. = total height of 10.925"
Piston compression height (piston deck to center of wrist pin) 1.625"
Subtracting 10.84375 from 10.925 we see that the piston should be about .081" below the top of the fire ring. = total height of 10.930"
Piston compression height (generic 74" piston) 1.415"
= total height of 11.07125"
Here we see that the piston would come out of the top of the fire ring by about .141". But if we add a .125" "stroker plate" (and another .020" gasket to seal the other side of it) it will put the piston deck about .004" below the top of the fire ring. Just right! That covers the main configuration, but leaves a lot of details to be discussed. I'll continue this "paper engine" in my next installment. A while ago I mentioned my great grandfather, L.J. Schlattman and his political leanings in a post titled From each, according to his ability; to each, according to his need . Recently while going through some papers in my desk I ran across a copy of the book of his poetry that he had published. The copyright on it gives the date of 1926. Its is not a large book; and perhaps I should more accurately call it a booklet, still it looms large in my life. There's nought from the abyss can save. Pass my pondering mem'ry today. Is it I must decay 'neath the sod? As for me, I'm summoned by God. To appear at the great judgement morn. All my thoughts, all my acts will be told. And say, "I've redeemed him, he's mine." "O Grave, where's thy vict'ry? O Death, where's thy sting?" May God grant that each of us can face the future with such an outlook when we reach the age of three score years and ten!